Timeless, classic and chic, the South of France is a movie. The rustic and romantic streets are lined with designer fashion boutiques, pretty little cafes, with a distant backdrop of the French Alps. It boasts a wonderfully turquoise coastline (my absolute favourite colour! ), hence the name Cote d'Azur, with yachts that sparkle like diamonds in the sea, each with their own security guards and diving boards. Glamour takes on a whole new meaning on the French Riviera. If you're unsure what the 'French Riveria' refers to, it is the Mediterranean, south-eastern coast of France, stretching from the Italian border, up past Saint Tropez. Some may consider Marseille to be included, though only recently has it begun to shake its somewhat unfairly given 'sketchy' reputation. The main headlines of my 5 day trip were Cannes, where I stayed, Saint Tropez, Monaco, Antibes, Menton, and Nice. Similarly to my trip to the Italian Riviera, I am in awe of the consistent natural beauty of such a long stretch of coastline, as well as the charm of its architecture and golden sunshine. The only way to afford this trip in the height of summer is to try and stay somewhere cheap! Book well in advance, and evaluate how much time you will actually be staying at your hotel. We decided that we'd rather save money by staying somewhere basic, and using our funds to experience what the South of France had to offer. Cannes is probably most famous for the annual Film Festival, where the world's most renowned celebrities celebrate the film industry with glitz and glamour. La Croisette, the main road along the coast, will not fail to impress you, with Dior, Chanel and convertibles on every corner. Don't let the hotels and the boutiques put you off; it costs nothing to walk down La Croisette, under the shade of the palms, and take in the view of the bay. 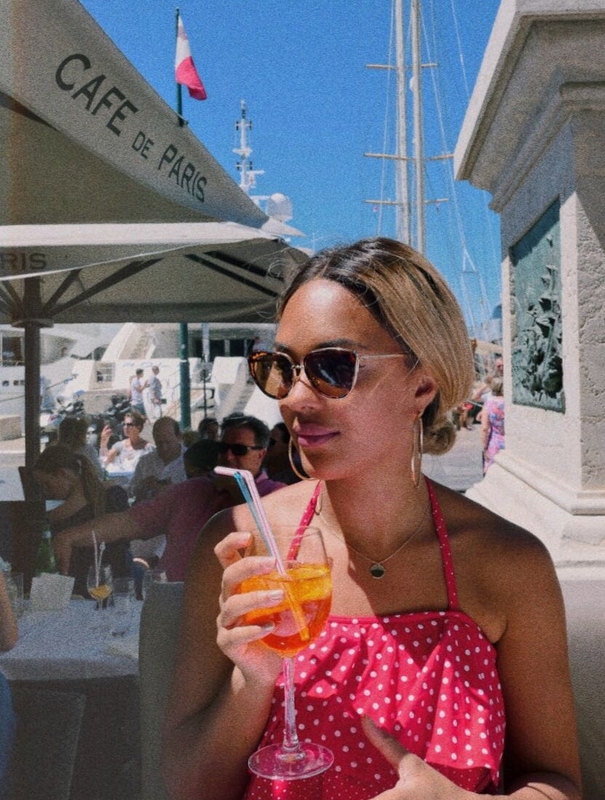 I particularly enjoyed the town at night, people watching at the 72 Croisette bar, sipping on my fave, an Aperol Spritz. Le Suquet, the old town, is a nice retreat from the dazzle of the main town, where you can get spectacular views of the harbour. DO NOT make the mistake I did of wearing heels. I tried, but I just don't know how women stay glam for the whole day! Comment below if you want to share your secrets. Le Suquet is really charming and dainty. TIP: Bring an empty bottle in your bag to fill up at the may natural water sources around the old town. A pretty, secluded island, Ile Saint Marguerite is the largest of the Lerins Islands, about 1/2 a mile away from Cannes. It is home to an old prison fort, and gives great views of the coast for 15 euros. Explore its fragrant forests, whilst admiring the epic 360° views of Cannes and the other Lerins Islands. Saint Tropez is literally as blissful as it sounds. It smells like peaches. We got a train and a bus to get there, and it honestly took about 4 hours each way. But it really was worth it. The only disappointment for me is the pebbled beaches. I love sand, even though it gets everywhere and hangs around for years. I would invest in some special beach shoes! There are some sandy beaches, but they were quite far and we didn't have a car. Saint Tropez used to be a modest fishing town, until the 20th century, where it soon became a hot spot for celebrity jet-setters. Listen. This place is so gorgeous. Spend your time wandering the lanes of the old town, popping in and out of perfumeries and delicatessens. Head down to the Vieux Port for an Aperol and a view of the 'once-fishing-village-turned-who has the biggest Yacht-show'! The pastel coloured houses are everything you imagined of Saint Tropez. We later found respite from the crowds on Plage des Graniers, staring at a beautiful view of Sainte-Maxime. Like, I said my only reservation about the beaches in France is the lack of sand. I'm a Caribbean girl so my standards of beach are high. How on earth this place exists and isn't a major tourist attraction is beyond me. I had never actually heard of Menton or seen photos of it until I researched the South of France - to put it simply, it is absolutely stunning. Close to the Italian border, you can see Italy from the harbour. It is nicknamed the Pearl of France for a reason. The fantastic thing about Menton, Monaco, Nice, Antibes and Cannes is that they are all connected by the train, so you can get from Cannes to Menton in under an hour. Imagine Mother Nature just opening a bag of skittles and scattering them on the ground; the colour of the buildings makes for a picturesque setting. Menton also hosts an annual Lemon festival! This town really has the architectural charisma of Positano, without the hustle and bustle of being overcrowded. In a way, I hope it remains as quiet as it is! Boulevard de Garavan is an elevated winding road, decorated in flowers, hugs the bay of Menton (Plage des Sablettes), offering spectacular views of the bay, the mountains, and even out to France's neighbour, Italy. Many Italians reside in Menton, and it definitely reflects in the architecture and the pace. Whilst heading up to Garavan might be a little steep (and a tad sweaty), you'll be glad to take a seat overlooking the multi-coloured old town, with the sun kissing the roofs and its reflection sparkling on the sea. If you're looking for nightlife and glamour, go to Monaco and Nice, but if you're looking for a gentle and laid-back, go to Menton. We almost didn't come here, but then someone really recommended that we did, and I am so glad that we did. Cap d'Antibes is home to the Musee Picasso, which I didn't get to. It was really just a pit stop but very worth it! Antibes is a port town, which has captured the hearts of many. The old town, which always tends to be the most charming of every town, is surrounded by old medieval walls, and houses the Marche Provencal, an indoor/outdoor market selling local produce.The traditional Provencal market sets out stalls selling regional produce, from cheese to spices to flowers. The views from the most southern point of the old town wall is gorgeous- you can right the way up to Nice Airport, and you get a panoramic view of the Alps. The world's second smallest country, but the largest bank accounts ever! Residents do not have to pay income tax. I repeat, NO income tax. It is gorgeous in a more modern-chic way. It is not dainty and sweet like the other towns, it ultimately looks like a real-life casino payout. If you're looking for a night of carefree (potentially reckless) casino fun, Monte Carlo holds the crown jewels. If you want to actually gamble, you need to be dressed appropriately (no shorts, hats, trainers), so went to the casino in Cannes which was a bit more relaxed. You can really dress up and make a night of it. Monaco-Ville (the older, medieval part), or Le Rocher, elevated above the rest of Monaco, is elegant and charismatic, as its lanes lead up to the Grimaldi's Palace of Monaco. On the priority list is Le Jardin Exotique, but don't bother paying to go in, (you can see exotic flowers pretty much anywhere now!) instead, just sit on the balcony in the entrance with a cool drink, and take in the most breathtaking view of Monaco! I sat here for a good 20 minutes. Nice is seen to be the capital of the French Riviera, it has a long stretch of coastline (Baie des Anges/Bay of Angels) alongside the Promenade des Anglais (though it is entirely made up of pebbles! ), and is home to the main airport of the South. Nice's rooftops and red and tiled, which only adds to its appeal. Nice is elegant, and simple. and reminds me in some ways of Brighton in the height of summer, with its cobbled lanes, and pebbled seafront decked in sun umbrellas. I could imagine gracefully strolling down the Promenade with a parasol in one hand and an ice-cream in the other. Parc du Chateau- for the best views of all of Nice; the Promenade, the Old Town and the Port. It's an absolute trek up to the top, but treat yourself to a slush puppy on arrival, and enjoy the surrounding views and waterfall. So to round up; Is the French Riviera beautiful? Yes. Is it expensive? Only if you make it! Is it crowded? Only the places you'd expect it to be. Should you go? YES. Flights to Nice are decently priced all year round, and it is warm from around April-October. I am returning this year, so I'll add some updates in October!